With the union budget presented in the Parliament few minutes back, optimism has been revived. The Finance Minister had dispelled doom predictions circulated by the usual fear mongering economics crowd and put a strong hope forward. Tax concessions and special allocation to revive the green revolution in Bihar, West Bengal, Orissa and Jharkhand and creation of oil seed villages are highly appreciable steps. An inspiring road map to rebuild the agriculture and long term strategies to checkmate the prices of food grains and essential items are missing from the budget. All the loopholes are glaring in the major social sectors like education, health and women’s development, budget 2010 deserves encouragement to pullout the society from deep crisis. Finance minister Pranab Mukherjee on Friday began the presentation of Union Budget 2010-2011 with a renewed sense of optimism over the country’s growth and clear signals from policymakers to bring deficits back to manageable levels. Referring to tax slabs, the finance minister said tax on income up to Rs 1.6 lakh would be nil, above Rs 1.6 lakh to Rs 5 lakh would be 10%, above Rs 5 lakh to 8 lakh would be 20% and above Rs 8 lakh to be 30%. Over and above Rs 1 lakh deduction on tax savings, an additional deduction of 20% for investment in long-term infrastructure bonds would be allowed, Pranab Mukheree said. Maninimum alternative tax (MAT) increased from 15% to 18%, direct tax concessions worth Rs 26,000 crore:, was another highlight of the Budget. In his speech, the finance minister also said cars would be costlier. Earlier, Mukherjee exuded confidence of introducing major reforms on direct and indirect taxes front in the form of Goods and Services Tax (GST) and Direct Taxes Code (DTC) from April one, 2011. “I am confident that the government will be in a position to implement DTC from April one, 2011… It will be my earnest endeavour to implement GST along with DTC from April one, 2011,” finance minister Pranab Mukherjee said in his Budget speech. This means that GST would miss its earlier introduction deadline of April one, 2010, by a year. While DTC will replace the archaic Income Tax Act, GST will replace most indirect taxes at central and states levels like service tax, excise duty, VAT, cesses, surcharges and local levies. The government proposed to extend the concessional export finance regime for select exporters for one more year till March 31, 2011, thus giving the slowdown-hit sector further relief. “I propose to extend the interest subvention of 2 per cent for one more year for exports covering handicrafts, carpets, hand-looms and small and medium enterprises (SMEs),” finance minister Pranab Mukherjee said . The scheme was to expire on March 31, 2010. With a view to insulate the employment-oriented sectors like hand-looms, handicrafts, carpets and leather, from the impact of demand slowdown the government had extended the scheme for concessional export finance in the last Budget till March 31, this year. Beginning his speech, the finance minister said the Indian economy had weathered the crisis well but the main challenge was to make growth inclusive. The focus is to get a double-digit GDP growth rate, he said. 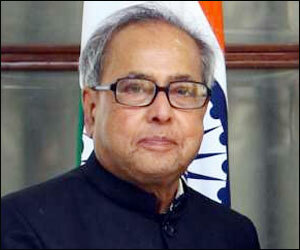 Social sector reforms will also be on the agenda, Mukherjee said. Economic growth in 2009-10 may turn out to be higher than 7.2%, the finance minister said. We hope to breach the 10% mark in not too distant future, he added. He said the need was to make growth more broad-based. Pranab Mukherjee said Rs 400 crore to be allocated for green revolution in Bihar, Jharkhand, West Bengal and Orissa, and Rs 300 crore for creating 6000 pulse and oilseed villages. In his Budget speech, the finance minister said allocation for roads has been raised by 13% and allocation for power sector doubled. 46% of total plan dedicated to infrastructure, he added. Pranab Mukherjee said listing of PSUs will improve corporate governance. Expectations are high from the 74-year-old veteran politician, who has tabled four budgets in the past, that he will address the twin issue of bringing down prices while ensuring higher overall growth for the economy. At the same time, he is also under pressure to roll back, albeit gradually, the $37-billion stimuli announced since December 2008 to help India weather the global economic slowdown. The Economic Survey 2009-10 presented on Thursday favoured the gradual rollback of stimulus measures that were introduced following the global economic meltdown in late 2008. However on the eve of the Union Budget, Mukherjee talked about the measures that would be taken by the government to deal with 17.85 percent food inflation and certain aspects of the economy. The union HRD minister Kapil Sibal is caught between the whirlwinds of private education providers and state control desiring politicians. One day he wants all the private establishments in the education to be brought under the total control of HRD ministry and the other day he wants total freedom for the private education sector. His unbalanced and weak position puts the students and parents under stress. Without understanding his responsibility and power, the minister skirts and fumbles his position which is the government’s one. 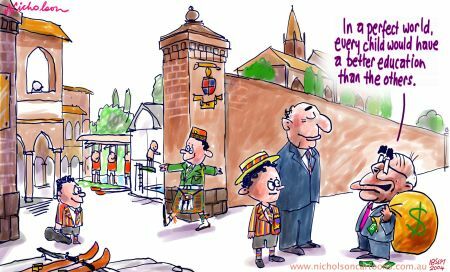 The latest confusion created by Sibal is the school fees in private establishments. In a conference organised by the private education providers in New Delhi on 19 February 2010, he said that private sector is free to fix the teacher’s salary. No questions asked if they give peanuts for teaching! This irresponsible statement will dilute the quality of teachers in private institutions who won’t stay for a long time. Teachers can be recruited by the private schools may be for weeks but they will migrate to better paying institutions sooner or later. This will surely dent the smooth functioning of the schools and affect the students parents psyche. If Sibal can’t do something to better the education system it is good for him to keep quite rather than kicking controversy after controversy and confusion after confusion. In what comes as a blow to the efforts of city parents’ associations which have been campaigning for reining in school fees, Union HRD minister Kapil Sibal said on Friday that the fees of private schools cannot be regulated and that each school had the right to fix the salaries of its teachers. Sibal’s claims contradict provisions in the Delhi School Education Act, 1973, which stipulate that remuneration of teachers in private schools cannot be less than their counterparts in government schools. The minister said this contradiction will go away once the Right to Education Act is implemented from April 1 this year ^ implying that the central Act will override the state law. “There is no such provision in RTE,” Sibal said about the salaries of teachers while addressing principals at the 37th annual meet of National Progressive Schools’ Conference — a group of nearly 110 private unaided schools in the city. “The salaries of teachers in private schools do not have to be according to the government. They will decide to pay what they want to pay,” he declared, while countering a speaker at the meet who had earlier said that small schools, which are now mushrooming in the city, did not have quality teachers because they could not afford to pay good salaries. While all schools were not required to pay Rs 22,000 (the minimum basic salaray as per the Sixth Pay Commission) to their teachers, there should be no compromise on the qualification of teachers, he added. The minister’s new announcement indicates that private schools in the city may finally get a free hand in deciding teachers’ salaries and consequently the fees, much to the dismay of parents. There have been many protests against schools hiking their fees last year. After the Sixth Pay Commission was implemented in the second half of 2008, schools sought to hike their fee to generate revenue to pay the teachers more. Delhi government then formed the Bansal Committee to decide how much fee a school could be allowed to increase and issued a notification in this regard on February 11 last year. However, according to Sibal, this act will be rendered ineffective from April 1. “Once the Right to Education (RTE) is implemented, the Delhi School Education Act will not apply.” RTE Act has already been notified. On regulation of fees, Sibal referred to the T M Pai case saying, “The Supreme Court has also said that fees of private schools cannot be regulated and yet some state governments have passed such acts,” he told the teachers present. The minister said he has also moved a malpractices bill under which all schools will have to give details of their infrastructure, number of students, salaries of teachers etc on their website. 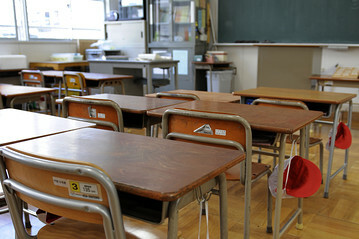 If the online information is found to be false, the school can be prosecuted. 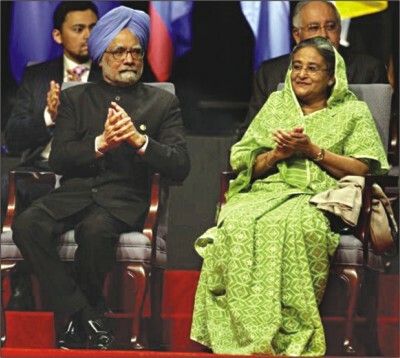 Sheikh Hasina, the Prime Minister of Bangladesh is a natural ally for India. When her father was fighting for freedom, India helped adequately. To repay the debts she wants cordial relationship with her neighbor. But how far India is ready to take forward her genuine desire? She was well received and awarded Indira Gandhi peace prize recently. This is not sufficient. India should move up to dispel the wrong impressions created by it and by the opposition parties in Bangladesh about its interests in the Eastern nation . As a bigger nation, India should give wider concession to Bangladesh keeping long term benefits and geo political strategies in mind. The history of mutual suspicion, petty bickering on trade negotiations, cavalier attitudes on border killings, dangerous gamesmanship with arms smuggling, etc, of the last three decades of Bangladesh-India relations would not normally justify the agreements that Sheikh Hasina penned sometime ago in Delhi. Only vision would. A vision of a South Asia doing what ASEAN did several decades ago, of trusting neighbours rather than of subverting them, of fighting poverty and not using it to justify other failures, of a thriving marketplace of goods and services rather than of counting items in the negative list. In the latest agreement, Bangladesh has moved towards such a vision. Has India responded? For us, the jury is still out. Take the two biggest concerns of the two sides: for India they are security and connectivity with the north-east; for Bangladesh water sharing and trade imbalance. There is a feeling that the clarity and precision with which Bangladesh responded to its neighbour’s concerns were not reciprocated in equal measure by India. On Indian security concerns, Bangladesh’s commitment was unequivocal: it will not permit the use of Bangladeshi soil for activities inimical to any other country, basically meaning India. It was in dramatic contrast to the past when India’s worries about terrorist links and arms transit fell on deaf ears. India desperately needed friendly borders in the east that Bangladesh has now assured and is following up by decisive deeds. Sheikh Hasina has launched the most determined and widespread actions against internal militants and extremists and is systematically dismantling the terrorist infrastructure. The permission for the use of the Chittagong and Mongla ports for shipment of Indian goods to the north-east is a very important step forward. With Bangladesh’s present position on Asian highway and railway routes, the regional and sub-regional connectivity scenario is set to undergo a fundamental change. On Bangladesh’s priorities water sharing and trade imbalance there is no dramatic progress. On Teesta water sharing, the positive development is that the ministerial level joint river commission meeting will be held within March, 2010. But it still leaves us with an uncomfortable ambiguity about the outcome. On the Tipaimukh dam issue, sadly, there was nothing new. The Indian prime minister reiterated his government’s earlier stand that India will do nothing that will harm Bangladesh’s interest. Such broad and generalised expression of good intention is definitely welcome. However clearer wording that further activity on Tipaimukh would only be undertaken after consultation with Bangladesh would have helped assuage remaining worries. On enhancement of economic and trade relations, especially giving Bangladeshi exports (which are meager to start with) zero tariff access, the issue remained mired in the politics of an ever narrowing negative list which will now come down by 47 from 260 items, which earlier was higher still. The absurdity is that India earns a meagre $10 to $15 million in taxes from exports from Bangladesh of around $300 million. That is what it would have cost India to give Bangladesh zero tariff. The promise of rebuilding of our railways, roads, bridges including the two ports, is welcome. The $1 billion credit line will serve to stimulate early action. However, all these are ancillary to both the functionality and efficiency of connectivity, which is a euphemism for ‘transit’. The offer of 250 MW of electricity is of extreme relevance and among the most significant gains Bangladesh stands to make. Another hopeful sign is the agreement to amicably demarcate our maritime boundary. Predictably, the Bangladeshi opposition, led by Khaleda Zia’s Bangladesh Nationalist Party and supported by Jamaat-e-Islami, have called the agreements a total surrender of Bangladesh’s interest to India. They have called for opposition unity and are clearly marking time for an appropriate moment to strike against Sheikh Hasina’s government. Manmohan Singh’s government must guard against the agreement getting entrapped in a bureaucratic maze, implementing its provisions soon. As a first step, India should formally assure that, as an upper riparian state, it will always consider Bangladesh’s interest and display maximum openness and transparency on water sharing. Killings on the border must immediately stop and the promised 24-hour access to Tin Bigha implemented. On maritime boundary, it should go for a liberal interpretation and allow Bangladesh access to all available hydrocarbon and fish resources. Zero tariff access must be granted to all Bangladeshi exports. This must be followed by elimination of all inter-state taxes and non-tariff barriers. We must institutionalise annual summit and informal meetings in-between, for a few hours on one-day trips, as EU heads of governments have done. Such a step will do wonders for our relations. The moment is opportune for India and Bangladesh to lay the foundation of a durable, mutually beneficial relationship that will transform the region’s strategic and security scene. Now is the moment for grand visions and grander actions. If Bangladesh was guilty of being shackled to the mindset of the past, let India not be accused of having failed to think outside the box when opportunity beckoned. The writer is editor, Daily Star, Bangladesh. Private investment or disinvestment in education? Private investors are queuing up to lock their wealth in the galloping education sector. Will this new found craze for educational returns for the investors will pay their gamble? or the recent steps by the union government to crack whip on the extra charging private educational providers will dent the interest among the private investors in education? One needs to wait and watch the results. The evergreen and recession-proof characteristics of the education sector are drawing interest among private equity firms. Billed to be a $80-billion market, the number of private equity deals in the education space has grown four-fold in the last four years. According to Venture Intelligence, a Chennai-based research firm focused on private equity and mergers & acquisitions, eight deals worth $121 million were sealed in 2009, compared with just two deals worth $73 million in 2006. The first educational institute to get venture capital funding in India was Career Launcher from Intel Capital as early as in 2000. And last week, India Equity Partners invested Rs 172 crore for a 26% stake in IL&FS Education and Technology Services, which provides training to schools, colleges and to the government and corporate sector. Unlike other sectors such as steel and automobiles which bore the brunt of economic slowdown, the education sector stood out as many professionals chose to go back to school as they waited for the gloomy scenario to change. Moreover, the government’s thrust that every child should have the right to education and the enhanced outlay to develop infrastructure reflect the growth potential of the sector. Also, education occupies a top slot in a typical Indian household budget. A cursory look around any neighbourhood would highlight the mushrooming of educational institutes and coaching centres in the last few years. Milestone Religare has invested in IMS Learning Resources, a test preparation firm for aspiring students across management, engineering and law streams. According to Singhal, the annualised return on investment could be between 25% and 30%. Funds typically have an investment horizon of 5-6 years. Private investors are queuing up to lock their wealth in the galloping education sector. Will this new found craze for educational returns for the investors will pay their gamble? or the recent steps by the union government to crack whip on the extra charing private educational providers will dent the interest among the private investors in education? One needs to wait and watch the results. Presidents, Prime Ministers, ministers, high officials, anyone and everyone are in the social networking sites. They don’t just spent their leisure time in these sites. From the time they take position in their offices till they get out, updating status, playing poker, commenting on friends photos and sharing sensitive information are routine affairs among the high profile official cyber citizens. The danger is that they are leaking official information and it is available for the public information. A terrorist can peak into their status updates and take enough hints to attack. It is high time to end the kiddish play of people in high positions to save the world from the perils of cyber terrorism. The first step is to be block these social networking sites in offices and public places. Any officer still doing it should be punished adequately. The government must issue an order immediately regrading this problem. lawyers, as status messages and tweets are admissible as electronic evidence under Indian IT laws. Even as Microsoft’s Bill Gates and Barack Obama joined the Twitter fraternity this week, a dozen other celebs have been creating controversies over the Web. People are even getting arrested for creating contempt of court, by tweets or wall posts, or creating trouble for governments, notwithstanding the Desi Tharoor saga. However, for the common Tweeter or Facebooker, daily updates about what’s on his or her mind may lead to robberies, thefts, arrests, break-ups and of course a divorce, suggest statistics. UK-based Divorce-online last month said that 20% of all divorce petitions it is handling currently contain references to Facebook status messages. “One can also take a print out or screenshot of a Twitter or Facebook post and can use it in any court proceedings either against or for you. Cases where social interactions on internet are used as evidence will only rise in the near future in India,” says cyber lawyer Pavan Duggal. But more than courts and spouses, your innocuous Tweet or status messages are being scanned by employers, before doling out job offers. While LinkedIn is a common social networking tool for professionals, employers sneak on the Facebook or Twitter personality of the candidate to read — “what’s on his mind”. “Assessing the soft skills of a person is very important both for the HR manager and the recruiter. 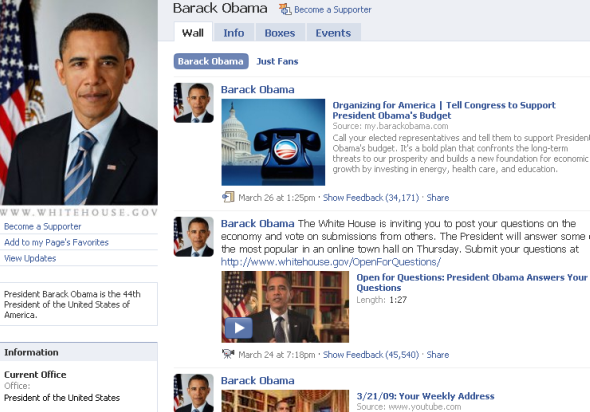 It shows how a candidate communicates to people around him. It also shows his interests on a daily basis. Often the demand for profiling social networking behaviour comes from the client’s side,” says Vikram Bhardwaj, CEO of executive search firm Redileon. On the other hand, just updating your location every time on web 2.0 sites and sharing it might not be a great idea. While you might be busy posting the beach photos while on a vacation with family, your house may be getting burgled in the meantime. A man in Arizona recently blamed his social updates, as a reason behind the theft at his house. Experts, however advise, that it’s best not to add your boss on your network, and even if you have already done, its best to put her in a separate list. Close family members like a spouse, should be avoided. A status message implying single even though you are married or in a relationship can definitely cause a turmoil in your home network, if not the social network, says Bangalore-based Parvati Kumar, an avid social networker. Defence personnel and spies too are not allowed to reveal their field location or unit or its commander’s name. Posting pictures in a uniform is not allowed. But many army and intelligence officials are often seen on Facebook with their profile and photo completely hidden. Ironically, discussion forums related to Indian intelligence works and their job postings are available on some Facebook groups. Even though a user may post any objectionable or anti-national content or even organise a rally against the state, on Twitter or Facebook, the new laws make them immune to action. “The social networking sites hosting such content are not liable to penal action under the recent amendments to Section 79 of the Indian IT Act notified in October, last year,” says Vivek Sood, a Delhi-based cyber lawyer. Meanwhile sociologists say that the web 2.0 behaviour will increase in coming years. “Human beings are generally gregarious. Since, now the shackles of family are breaking down, people want to express themeselves more often, even what they are thinking. It is a compensatory mechanism for the non-existence of face-to-face communities. The phenomenon will increase,” says Dipankar Gupta , professor of sociology at Delhi’s Jawaharlal Nehru University.